Last Monday, in the bayous of Biloxi, Mississippi, trucker David Fredericksen went all Batman on everybody and saved a woman and her 1 year old granddaughter from a burning car. The entire incident was also caught on the man’s dashboard camera and has now been uploaded to Youtube. Seeing that the car had swerved across the highway and burst into flames, Fredericksen then slowed down and ran to the scene with a fire extinguisher in hand. After slowing the fire down a bit, Frederickson looked into the car to see if anything could be done. There, he saw the driver struggling to kick her door out and the infant and her car seat tossed across the vehicle. He immediately pulled out both of the victims. In rewards for his heroic action, Fredericksen will be appearing this morning on Good Morning America. That is an interview that will definitely be worth watching! 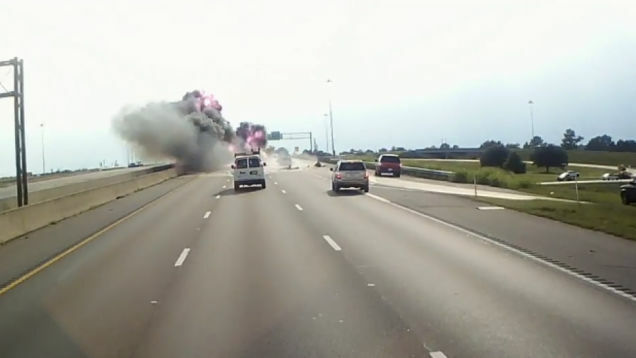 This entry was posted in Video and tagged crash, david fredericksen, hero, save, trucker, wreck. Bookmark the permalink. If Autonomous Cars Save Lives, Where Will We Get Our Organs?